Passive or Active Solar Water Heater? Heating your home’s water supply with solar power can save you hundreds of dollars a year. If you are looking for ways to stretch your monthly energy dollars, how about investing in one of the oldest forms of technology available: using the sun to heat your home’s water? Clarence Kemp patented the first commercially available solar water heater in 1891, and, since that invention more than a century ago, improvements in design, storage, and components have made solar water heaters the perfect starting point for homeowners looking to create a more sustainable home. Of the reasons to install a solar hot water heater, the primary one is saving money on your monthly energy bills. According to the U.S. Department of Energy, water heaters account for 10 percent to 15 percent of a single-family home’s monthly energy bill. By using the sun to augment the delivery of heat to your water, you can significantly reduce the amount of gas or electricity used to heat water. By some estimates, homeowners can save over $500 in their first year of operation and, with the more aggressively priced commercial systems, should see a complete return on investment in as few as five years. This is especially true in homes that use electric hot water heaters, which tend to be less efficient than gas systems. With power prices on the rise, adding a solar solution to your home could save you thousands of dollars over the lifetime of the system. The federal government and many states now offer rebates and incentives. In some cases, these can significantly offset the purchase price of the system, which allows for an even faster return on investment. If you’re in the market for a solar water heater, you will need to do some research and shopping around to find the right product for your needs. When evaluating your options, it is important to have a clear idea of what kind of system you need. Before selecting a solar water heater, you’ll need to consider your lifestyle, climate zone, budget, and environmental impact goals. 1 How much hot water do you need to generate? Lifestyle has a major impact on how effective your domestic solar water heater will be. If you have a large family and a great demand for hot water, especially during the day, an active system with a larger collector will probably fulfill your family’s needs. On the other hand, if your household consists of only one or two people and activities like laundry are infrequent, a smaller “batch,” or passive, system might be better. A quick way to determine your expected household hot water use is to simply multiply the number of occupants by 18 gallons. A family of four uses about 72 gallons of hot water a day for laundry, bathing, cleaning, and cooking. This number will help you gauge not only the collector you need but also the reserve tank necessary for keeping your family in hot water. Most systems are configured based upon expected output of hot water for a specific climate. In sunny, warmer areas such as Florida, Arizona, and Southern California, a tremendous amount of hot water can be generated using a relatively small system. In colder regions, a larger collector will be required, and an active system may be needed to satisfy the home’s hot water needs. It is also important to know if there is a potential freezing risk for your system. If you live in a colder area, you might have to select a “drainback” tank model or a system that will automatically monitor the temperature to reduce the risk of a pipe bursting in your collector. Solar heated domestic water does not have to be expensive. When compared to photovoltaic arrays, solar water heaters have a much faster return on investment and are much more affordable. For only a few hundred dollars, you can build your own batch-style system, and even commercially manufactured systems for warmer climates can be very affordable. Before shopping, be sure to get exact estimates from your plumber and check with local housing code officials to make sure you won’t have any hidden costs once installation begins. 4 How green do you want to go? If you are going to purchase a solar water heater, the benefits will be many, but a common goal is to reduce the overall need for carbon-based fuels like coal or natural gas. While the “greenest” and most economical option would be to simply alter your lifestyle so that you don’t use as much hot water (like taking “navy” showers, washing your clothes in cold water only, and turning down the temperature on your current hot water heater), installing a solar water heater can make a significant positive impact on the environment. To really go green, try to find systems that don’t require any additional energy to function. This can include choosing a simple batch heating system or passive system that uses thermodynamics to power the circulation process. 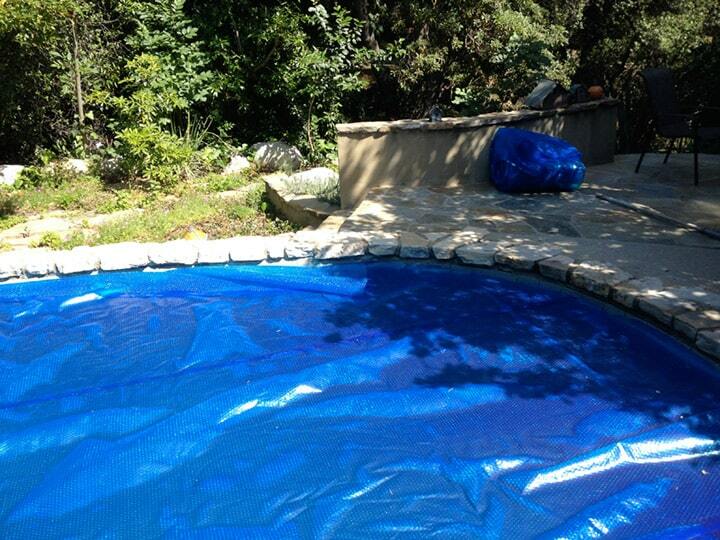 Another way to avoid having to plug in your system is to purchase a solar-powered circulation pump. Once your new system is installed, altering your lifestyle to take advantage of the solar-powered hot water is an excellent way to optimize your environmental impact. By using a majority of your hot water in mid- to late afternoon you can help ensure that you will be getting the most from your new system. Once you have determined your hot water needs, system style, size, and budget, you are ready to go shopping. When trying to choose the best solar water heater system for your needs, the first thing you want to decide is whether to install an active or passive system. A passive system uses the principle that warm water rises as cool water sinks to circulate hot water through the system; an active system pushes water with the help of a pump. An active system requires a little more equipment—some kind of circulating pump and a few other components—and, because of this, it is generally more expensive and has more potential for things to go wrong. It requires electricity to run the pump, so it is also less energy efficient. On the flip side, it can provide abundant, continual hot water because the pump circulates the water through the system. 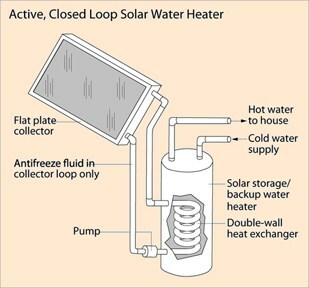 Solar water heaters are comprised of three basic components: collector, tank, and circulation system. 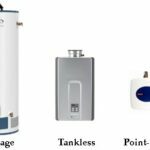 Of the three components, the collector has the greatest impact on the efficacy of your water heater as it is the part of the system that collects the warmth from the sun and transfers it to the water. For more about the complete workings of solar water heaters, see How a Solar Water Heater Works. Following are reviews for passive and active solar water heaters currently on the market. If you are looking for a simple approach to solar water heating, a passive, or “batch,” system is probably preferable to an active solar water heater. Passive systems use the properties of thermodynamics to circulate the water through the system. When water warms up, it naturally moves towards colder areas, which creates natural circulation within the system. Though effective in warm climates, passive systems generally offer less hot water than active systems and are more vulnerable to freezing. In looking at a number of models, our expert took a close look at the ProgressivTube PT-40. ProgressivTube PT-40. ProgressivTube passive solar water heaters are self-contained single-unit systems that integrate the solar collector and storage tank. In most applications, this model functions as a pre-heater to an instantaneous or conventional water heater. Because ProgressivTube uses only local water pressure and solar radiation to operate, no pumps, controls, or mechanical or electrical components are required. This lack of moving parts greatly reduces the amount of maintenance required and extends the life of the system. The PT-40 system includes a bypass valve and drain tap to allow homeowners to evacuate the collector of water in case of hard freezes. Once installed, the system will work automatically. Water is circulated to the collector, where it is stored until hot water is used in the home. Once there is a call for hot water, the solar pre-heated water is drawn into the conventional water heater, reducing the amount of electricity or gas needed for water heating. The ProgressivTube PT-40 solar water heater retails for less than $1,800 as a complete system. According to the manufacturer, it may reduce annual water heating costs by 50 to 90 percent. 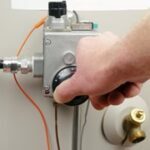 If you live in a cold climate or are looking to really get the most out of your solar water heater investment, an active system may be the way to go. Active solar water heaters force water through the system using a series of pumps and valves to maximize delivery of the sun’s energy. Two popular models are the Fafco PN760 Hot2o and SolarRoofs Skyline System 3. Fafco PN760 Hot2o. Specifically designed for homes with electric water heaters, the Fafco PN760 Hot2o solar water heating system is the only polymer system designed for domestic water heating. Fafco made a name for itself by first using polymer materials for swimming pool heating systems, and these polymers have now become the industry-standard material for non-domestic purposes. While most solar heating systems employ copper tubing in the collectors to absorb and retain the sun’s energy, the Fafco system uses extruded polymer. The advantages of this sort of circulation system is that the unique self-locking connectors and flexible polymer tubing do not require fittings, which reduces installation time and labor as well as leak risk. If mail ordering the system, you’ll appreciate the fact that the Fafco collectors weigh considerably less than traditional systems and are more compact. Retailing at around $2,200, the PN760 Hot2o system has a 10-gallon capacity and includes a wall-mounted drainback tank to prevent damage to the system from freezing in colder climates. The circulation pump uses a standard 120-volt electrical supply and is activated by a programmable timer to maximize solar exposure. Two roof-mounted collectors are included in the system, and additional panels can be purchased for about $450 to increase effectiveness. The low-profile collectors have a 2-foot width by 12-foot length. SolarRoofs Skyline System 3. The SolarRoofs Skyline System 3 is another active solar water heater that retails for under $1,800 and offers homeowners a complete system ready to install out of the box. The Skyline System 3 has the advantage of connecting directly to your existing hot water tank and not requiring an additional storage tank to supply your home with hot water. Using the more traditional copper tubing to absorb the sun’s energy, the Skyline System 3 is an “open loop” system that directly circulates the water from your water tank through the collector. This type of system is much more effective in transferring the collected heat energy directly to your home’s water supply, but it can be vulnerable to cold weather. In sustained freezing temperatures, water in the system may freeze. Frozen pipes would not only block circulation but also pose the risk of bursting the collectors’ tubing. In regions where light freezes are possible, the systems are protected two ways—they are fitted with a dribble valve that will drain the collector of all fluids as temperatures approach freezing, and they recirculate a small amount of warm water from the water storage tank to prevent freezing. Another feature of the Skyline System 3 is that the package includes a photovoltaic-powered circulation pump. This feature allows for the system to operate without adding any cost to your electric bill. When the sun is up, the system automatically starts circulating water. The Skyline System 3 also includes a mixing valve to protect from high solar water temperatures, 50 feet of copper pipe to link the collectors to your water tank, and mounting rails for the collectors. The collectors come in two sizes, a 20-1 style that is 12 feet long by 20 inches wide, and a 10-1 style that is 6 feet long by 20 inches wide. Forty square feet of collector area is used in mild areas, from California through the southern states. For colder regions such as New England, Colorado, and the northern states, 60 square feet of collector area is recommended. Solar water heaters are typically installed by professionals because of the complexity of the plumbing and the difficulty of working on a rooftop without damaging the roof or becoming injured in the process. 1 Be sure to include a freeze valve on your system. A freeze valve will keep your system from freezing solid and cracking. These valves often sense when the water temperature is about to dip below freezing and bleed enough water out of the system to circulate relatively warm fresh water. These are a must-have for passive systems. 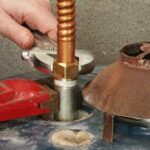 2 Install a shut-off, bypass, and drain spigot on your system. These valves allow you to detach the solar hot water collector without completely disconnecting the water to your existing hot water tank. They can come in very handy, especially if your system does not have a freeze-prevention valve. 3 Install scald guards on your system if you live in a sunny climate. Solar water heaters at times work so well they can present a scalding danger to the home’s occupants.